This is the twenty seventh in a series of reviews of the best dive resort locations around the world. In this post, the focus is Green Island, Taiwan. Background – 33 km (21 miles) from Taitung off the southeast coast of Taiwan is Green Island. At high tide it has an area of 15 square kilometers (5.83 square miles) and a population of around 2,600 depending on the season. During martial law that lasted from 1949-1988 and a few years beyond that, it was used as a penal colony. Today it is a popular tourist destination. It is volcanic in origin and has native wildlife that includes deer, goats, chameleons, giant bats, coconut crabs and resident, and migratory birds. Undersea World – When the prison was in operation there was no fishing or other human disturbance of any consequence to the sea around Green Island, as all activities around it were restricted. I recall from my time living in Taiwan from 1986-89 that very little private boating and hardly any scuba diving took place at all anywhere around the country. The government was very concerned about its relationship with the mainland and kept a very close eye on all seafaring activities. After closing the prison the restrictions were lifted and many destructive practices took place, for a time, involving commercial fishing and the aquarium trade, that took a toll on the reef. 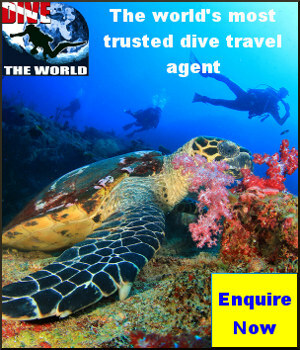 When scuba diving started to become popular these practices were outlawed and it is now a marine reserve. Sea life has recovered to a major degree, diving is more popular than ever and Green Island is developing a reputation as a premier diving location. The rich and diverse fringing reef has more than 200 species of coral and 300 species of fish. 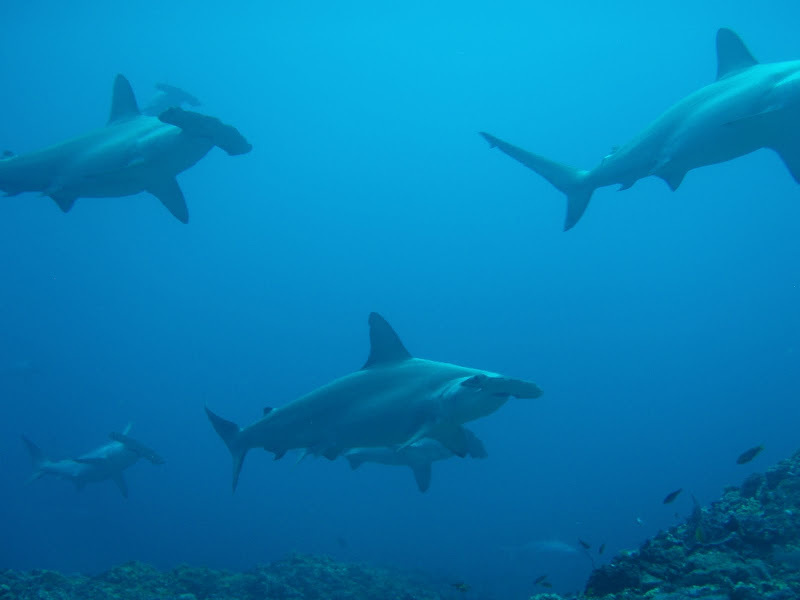 Off of the southeast corner of the island near the world famous sulfur and salt water hot springs is a site called Shark Point with powerful currents and in season hundreds of shoaling scalloped hammerhead sharks. On the west central coast in Nan Liao Bay is reputed to be the world’s largest coral bommie, at 16 meters (54 feet) in height and 31 meters (104 feet) in diameter. This bell-shaped behemoth takes a good few minutes to swim around. The reef around Green Island is not too dissimilar to that much further south in the Philippines. Highlighted creatures include nudibranchs, pygmy seahorses, moray eels, banded sea snakes, large fan corals, titan triggerfish, cuttlefish, pufferfish, lionfish and on the larger side, batfish, dogtooth tuna, mahi-mahi, trevally, green and hawksbill turtles, eagle and manta rays, and humpback and sperm whales, not to mention the hammerheads. 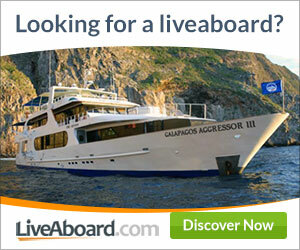 Overall there are approximately 30 dive sites including a couple of wrecks. Seasons and Conditions – It is warm in Taiwan with daily highs in a range from 25-32°C (77-90°F). Water temperatures range from 24-29°C (75-85°F) with the coolest in January and February and the warmest from July to September. Visibility is generally quite good, at times to 40 meters (130 feet). 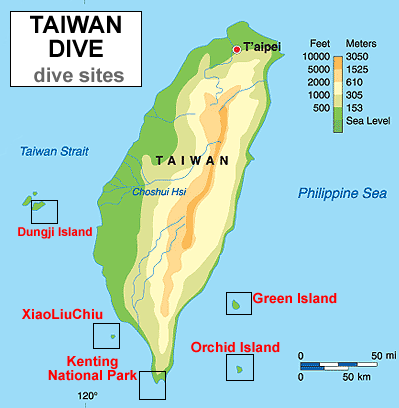 *If you have dived Green Island, please fill me in with descriptions of the dives you did in the comments section. Thanks. International flights to Taiwan mostly land at Taoyuan International Airport, a one hour bus ride from Taipei where you can take a domestic flight from Songshan Airport to Taitung. A few flights from Asian countries land at Kaohsiung International Airport where you can avoid the bus ride and directly catch a domestic flight to Taitung. From there small aircraft offer a 15 minute flight to Green Island. These tickets need to be booked in advance. Ferries are also available from Taitung town or Fugang Harbour to the north, that take one hour. This is often a choppy ride. Green Island is not large, so activities are limited. One thing you will have an opportunity to enjoy every day is Taiwan’s cuisine. There will be a variety of seafood well prepared even in small joints. One, of only three in the world, sulfur and salt water hot springs is on the southern end of the island for a therapeutic and relaxing bath. 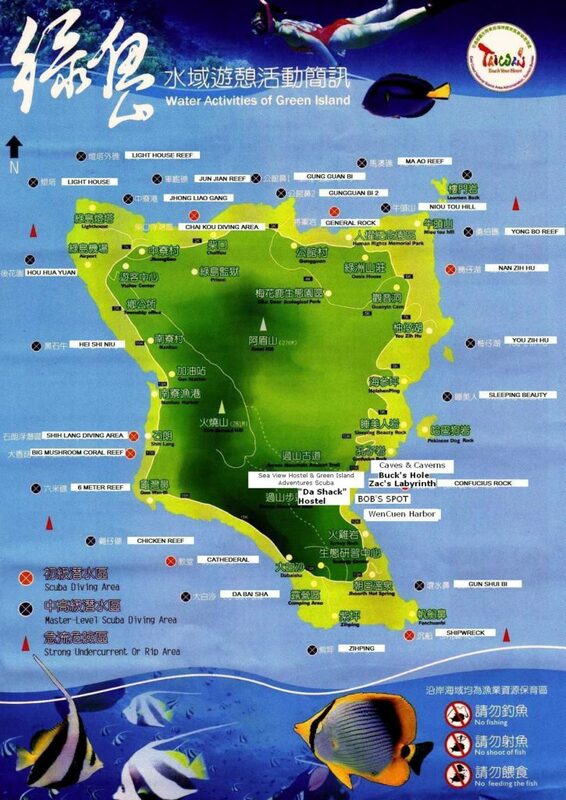 You can visit the Lu Dao (Green Island) lighthouse and the Green Island Human Rights Cultural Park. Hiking, renting a scooter to ride on the ring road around the island and visiting an abandoned aboriginal settlement are also options along with the obvious swimming, snorkeling and other seaside activities. How much beauty is there in that place. I’ve gone diving in many places that promised hammerheads, but actually, none ever showed up. This looks like a great place to give it another shot. Coincidentally, I plan to be in Taiwan in a few weeks during their season. I’ll make a point to get my free time squared away so I can go down to Green Island and give it a shot. 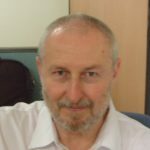 Thanks a lot for all the information and videos, it was a pleasure to read and watch. Perfect. I hope the hammerheads are there for you. A reminder, you’ll probably need a 3-5 mm wetsuit and be prepared for a negative entry and possible strong current. Please write back with the result. Also, please do me a favor and give me a brief report of the dive sites you go to. If you could give me the info from your logs it would be great. Thanks. I am happy you found my site and left such kind comments. When you decide to jump in and get started with diving, I suggest you check the dozens of diving locations I review on the site. 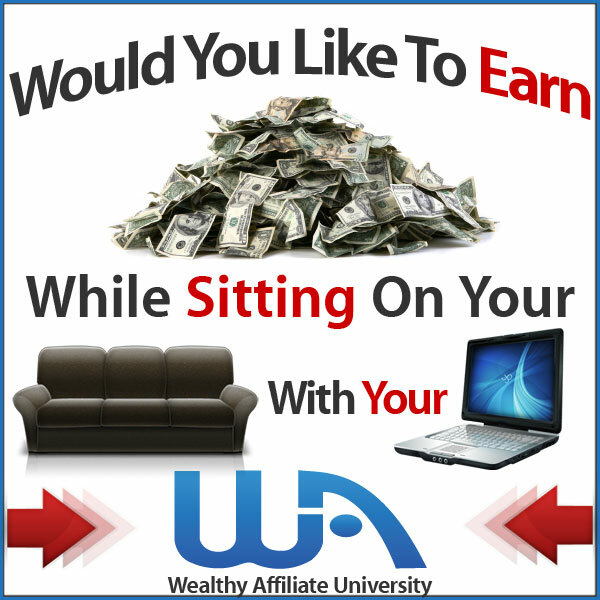 If you have any questions on how to get started, please let me know. Thanks, Joe for this great review on scuba diving, I have never given scuba diving a thought although I have seen a lot of people crave for it, and this review came along and made me realize I have indeed been missing a lot. The location you made a review on has been on my top ten locations to get a vacation, I finally I am gonna do it.